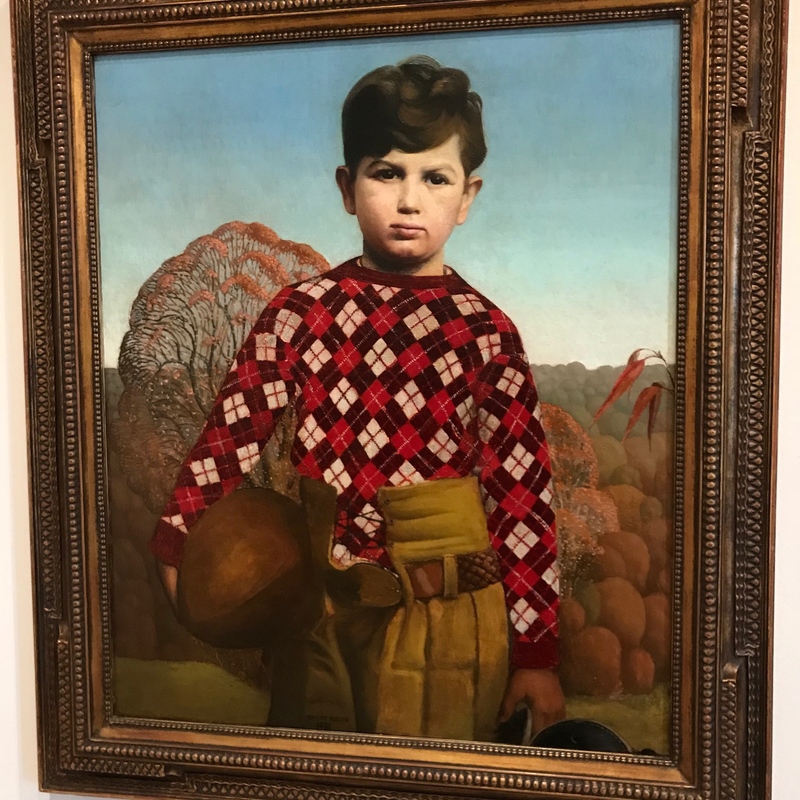 Before the Big Reveal from the estate sale in Connecticut, my partner in crime and I decided to avoid reality and get cultured. 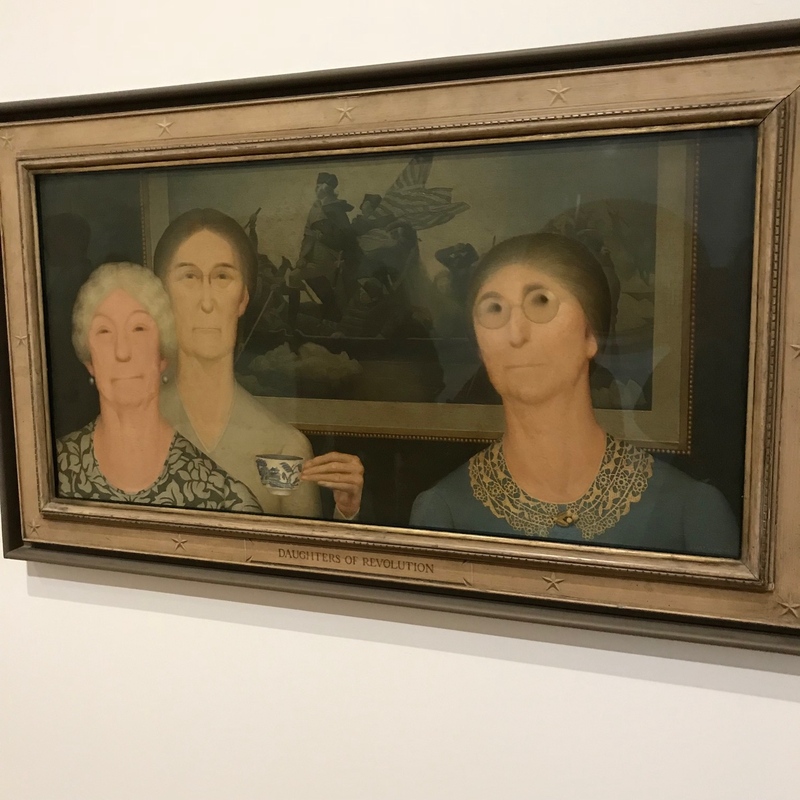 We headed down to the Whitney Museum with all the drunk green people. Yep, St. Patrick’s Day was already going strong by 9;30 am. 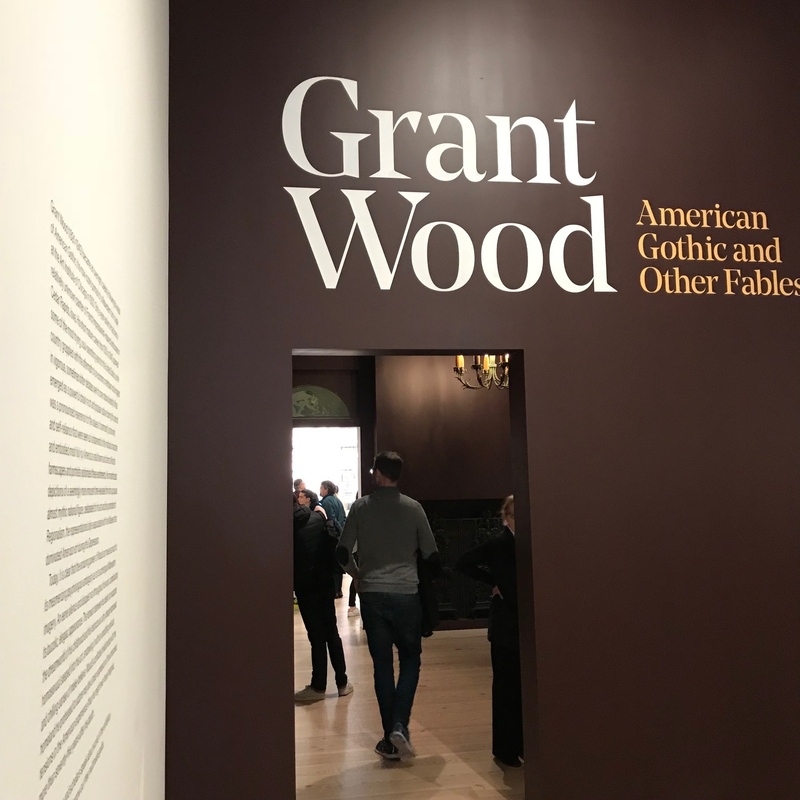 Being a member, we waltzed into the museum and quickly ascended to the 5th floor to view the new exhibit, American Gothic and Other Fables. 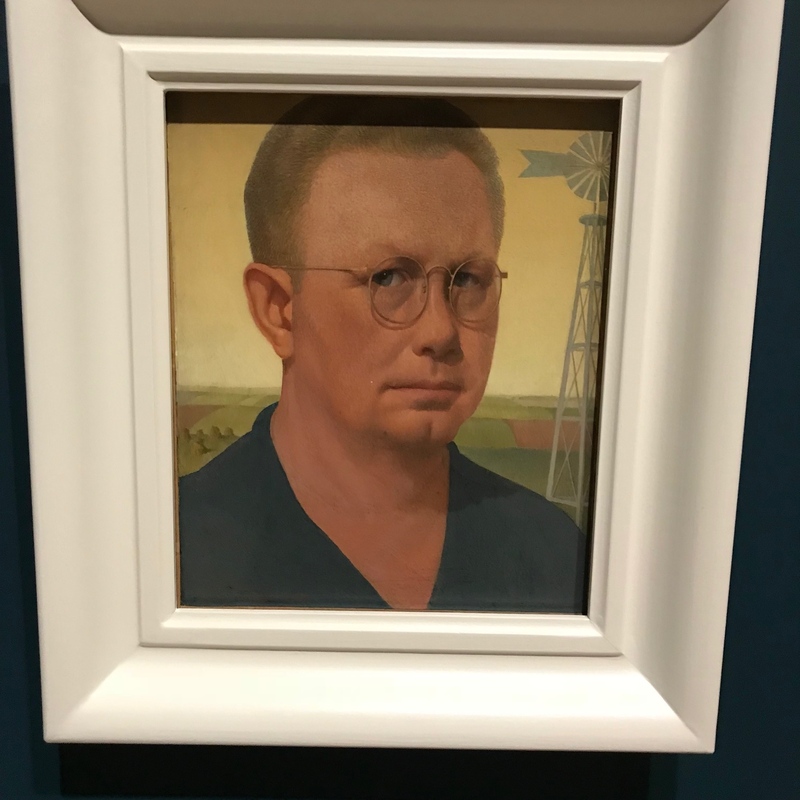 To be honest, I was not all atwitter to see Grant Wood’s acclaimed painting, American Gothic. 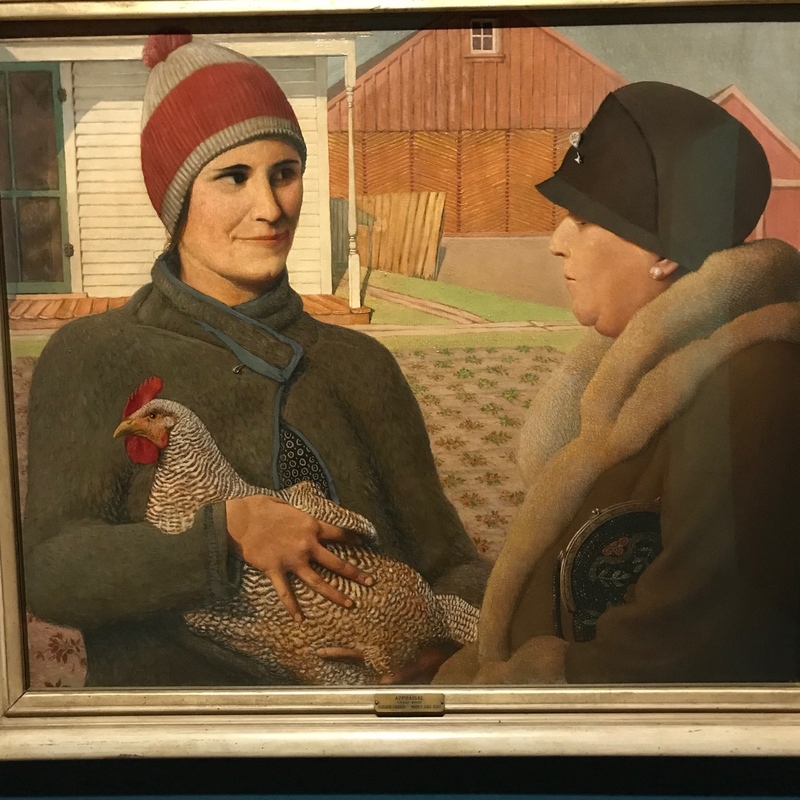 Perhaps the portrait reminded me of middle America Trump voters. 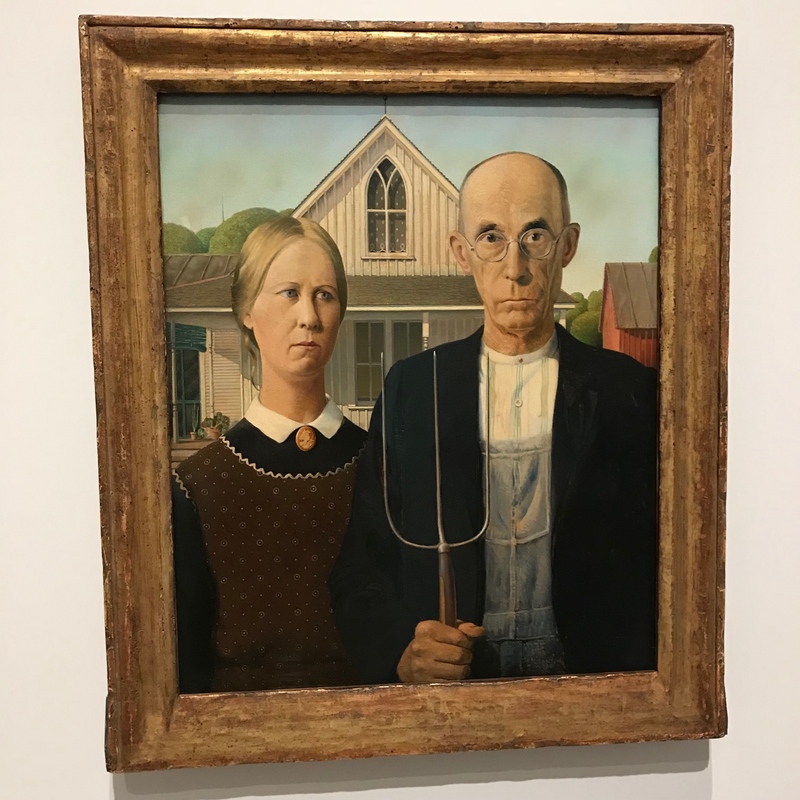 The American Gothic painting is a very small part of what the talented, prolific painter is about. 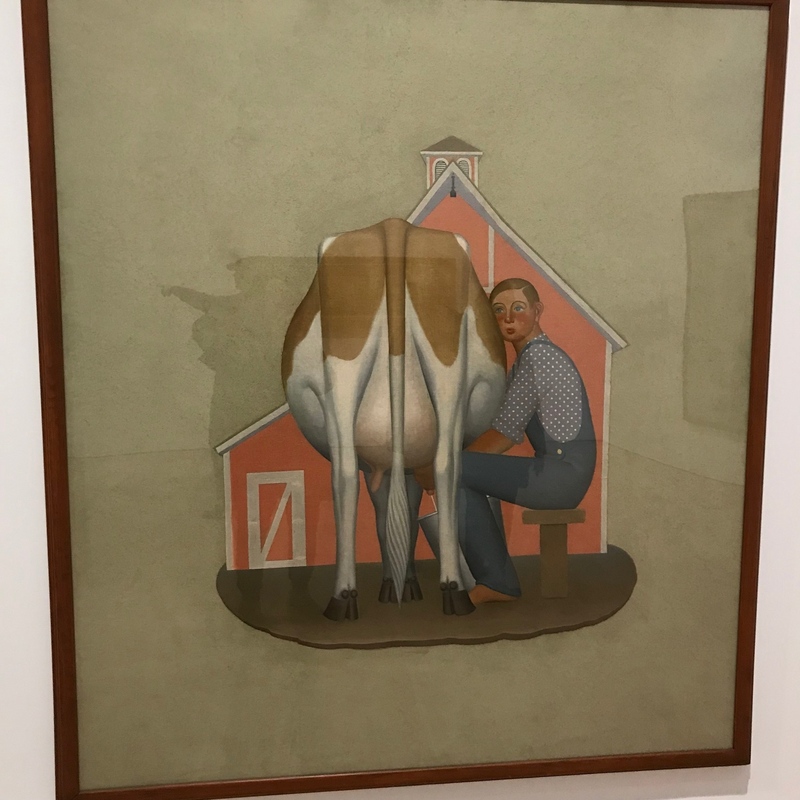 Wood became an overnight sensation following the debut of the painting, American Gothic, a portrait of a Midwestern farm couple who, in actuality, was his sister and his dentist. 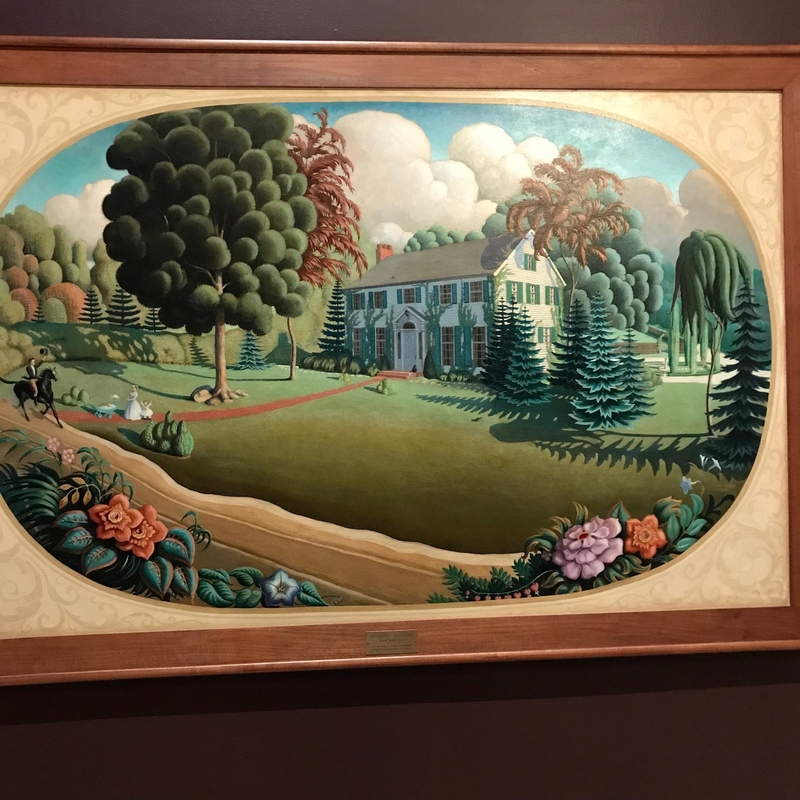 Prior to his instant celebrity, Wood had been a little known French Impressionist-inspired landscape artist living in Cedar Rapids, Iowa. His career, which spanned from 1930-1942, occurred during the aftermath of an economic meltdown in America. 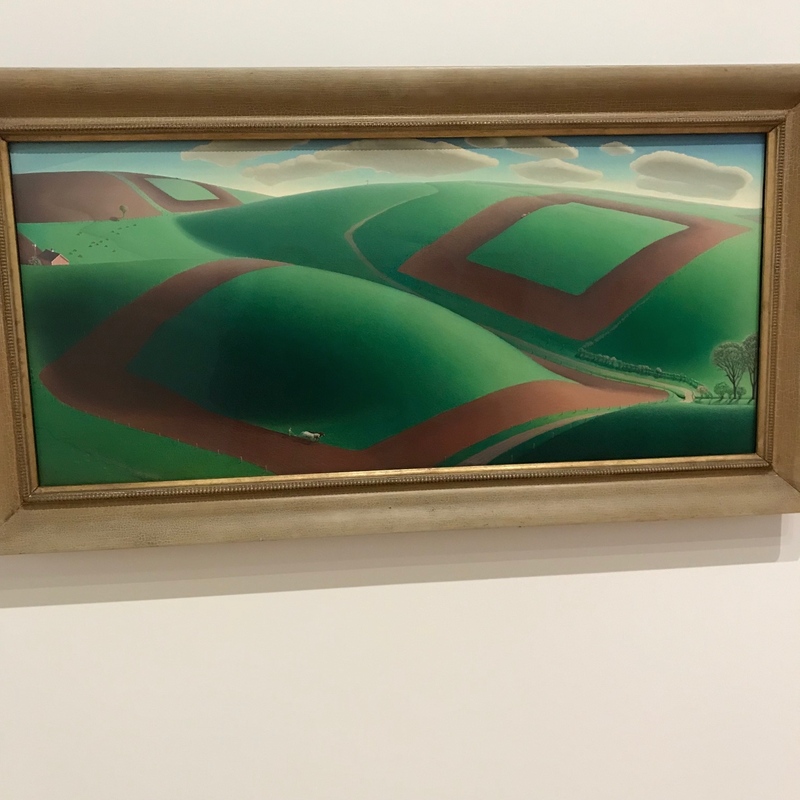 Wood’s work reflected the times. 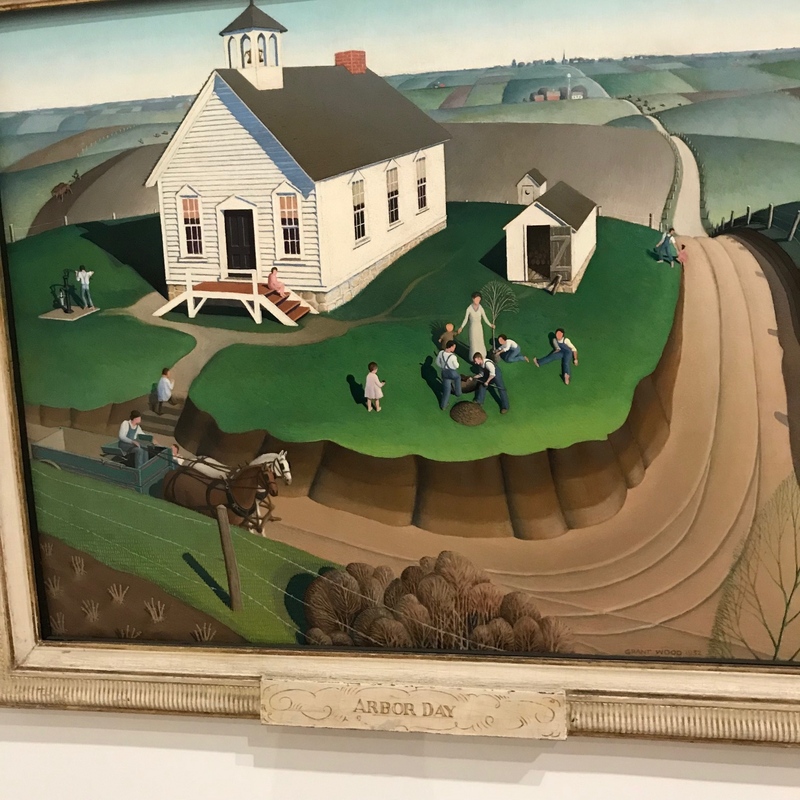 Americans had become more insular, investing in community and hard work within the confines of rural America. A sense of uneasiness runs through his word, complicated by his deeply repressed homosexuality. 1927 was a turning point for Wood. 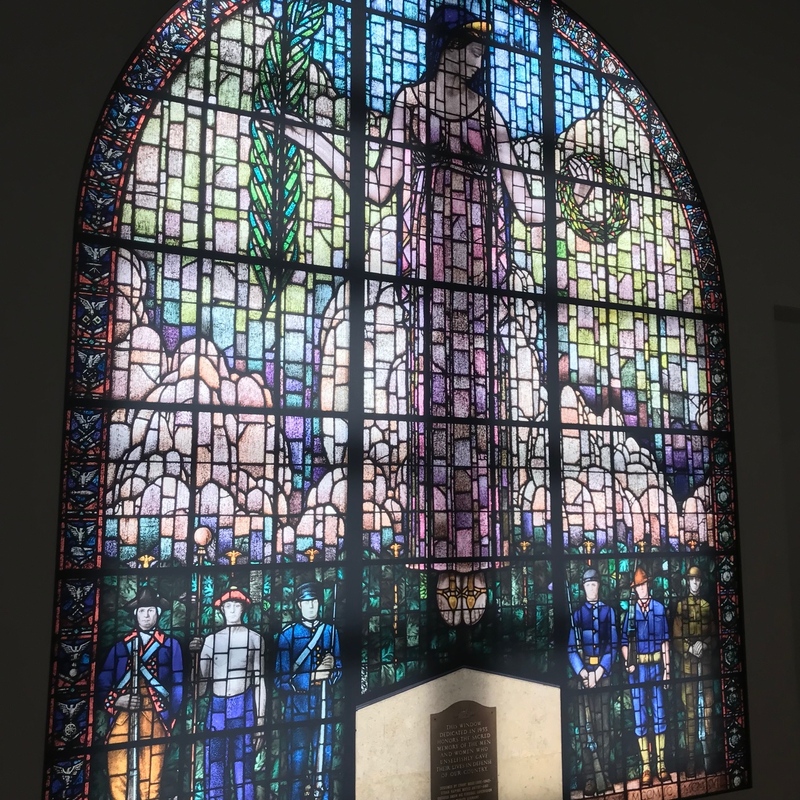 He was awarded a commission to create a stained-glass window for a Cedar Rapids Veteran Memorial building. Wood hired a St. Louis glass company with a branch in Munich. 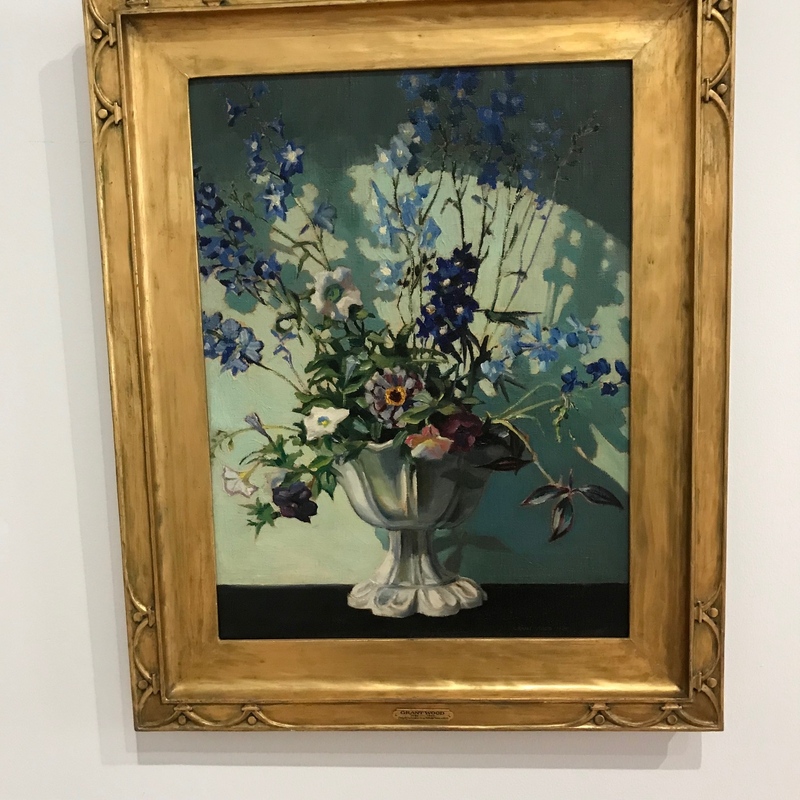 He traveled to Germany to supervise the production and the process rekindled a delight in craftsmanship, causing him to abandon his Impressionism bent. 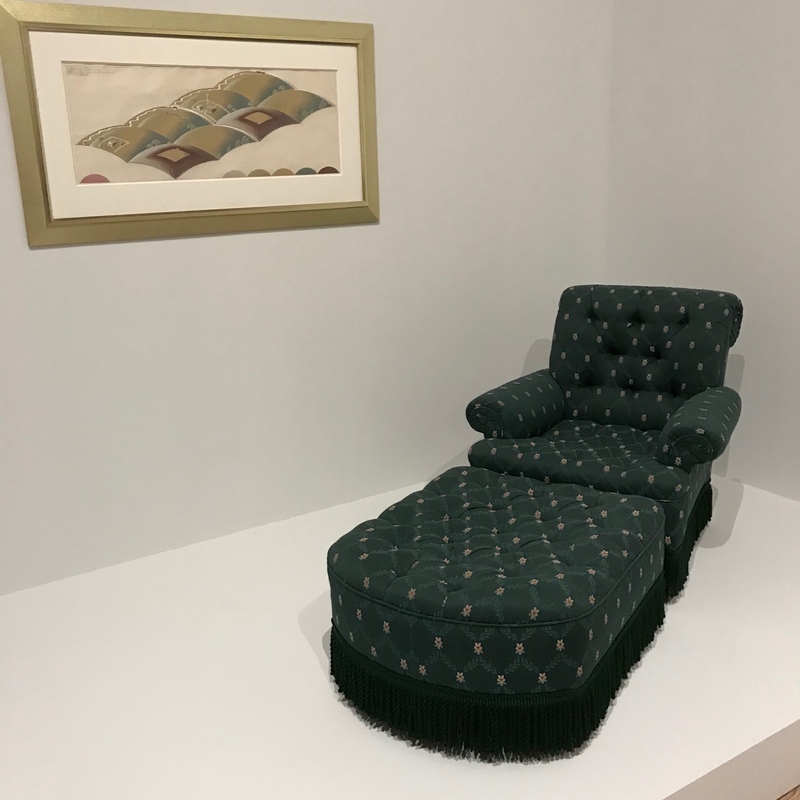 He also dabbled in furniture design and his “Grant Wood Lounge Chair” was sold in furniture stores throughout the Midwest. Wood’s work was methodical. 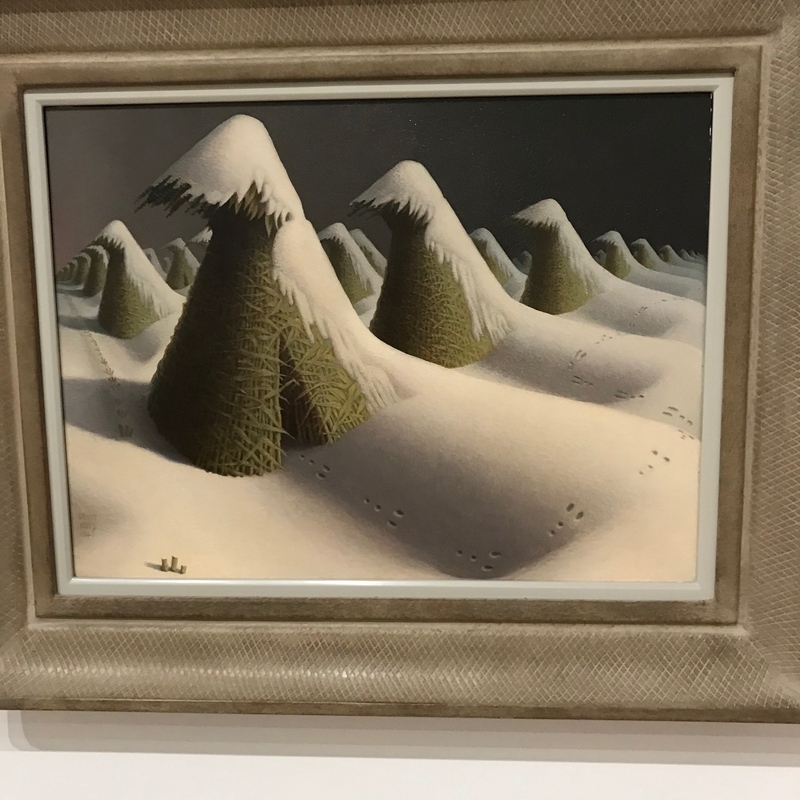 He made full-scale drawings of each of his landscapes before beginning them in oil. 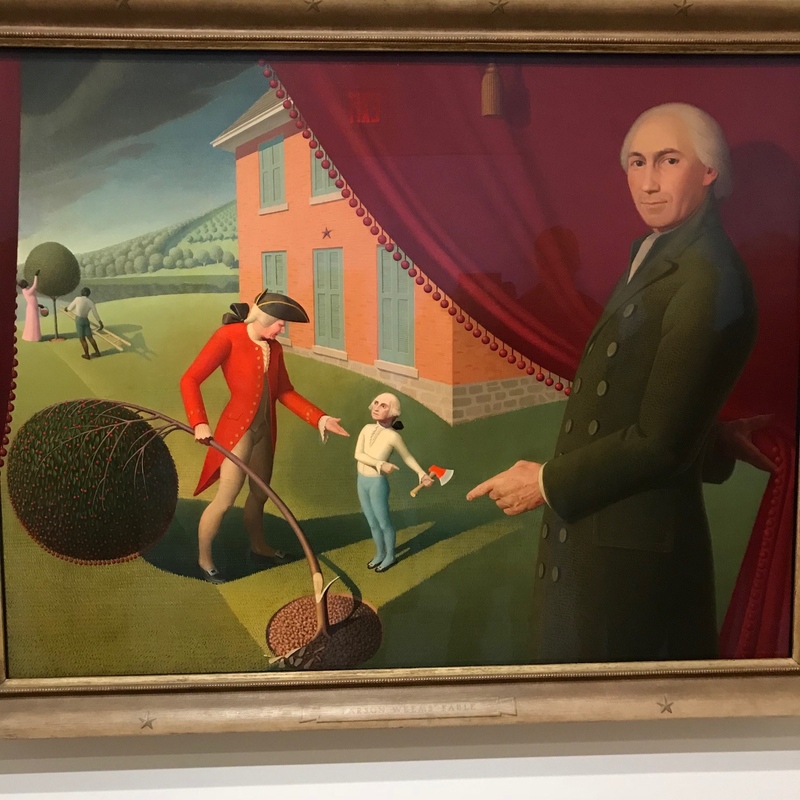 A whimsical example of his work featured Parson Weem’s 1806 fable of a young George Washington confessing to having cut down his father’s cherry tree. Wood portrays Weems standing in the foreground, lifting a curtain to reveal the future president’s guilt. Another satirical standout is Daughters of Revolution (1932) which aimed to ridicule the Daughters of the American Revolution for their claims to nobility. 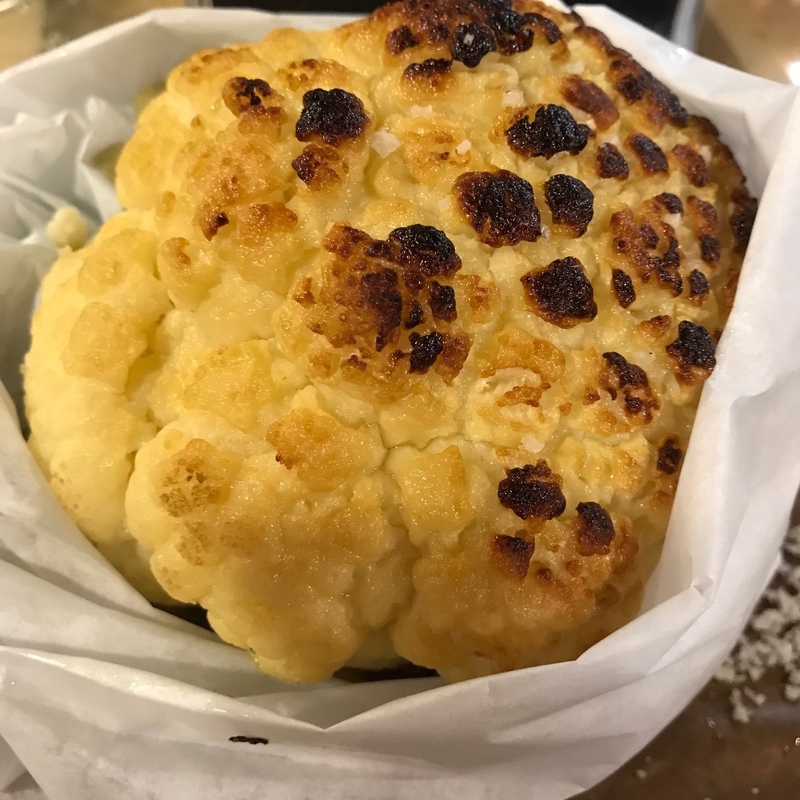 Satiated by culture, but ravenous for food we headed to Miznon for light and fluffy pitas with a side of cauliflower. The clock was ticking as we had to be in Connecticut by 4pm. We scurried onto the 1 train. Never a dull moment when traveling by subway these days, we were delayed for 20 minutes at 34th Street because a bag had been found abandoned at 42nd Street and a police investigation was underway. We rushed to the garage and fled to the suburbs to find the house stripped and memories sold. 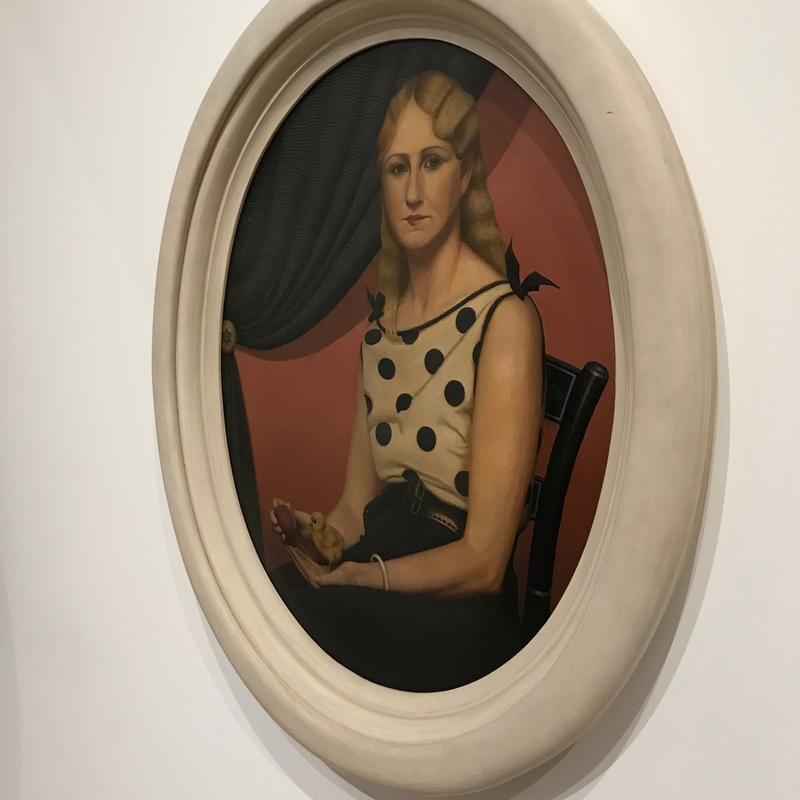 American Gothic and Other Fables Whitney Museum of Art 99 Gansevoort Street New York City Open Monday, Wednesday-Sunday 10:30am-6pm. Open until 10pm on Friday and Saturday nights. 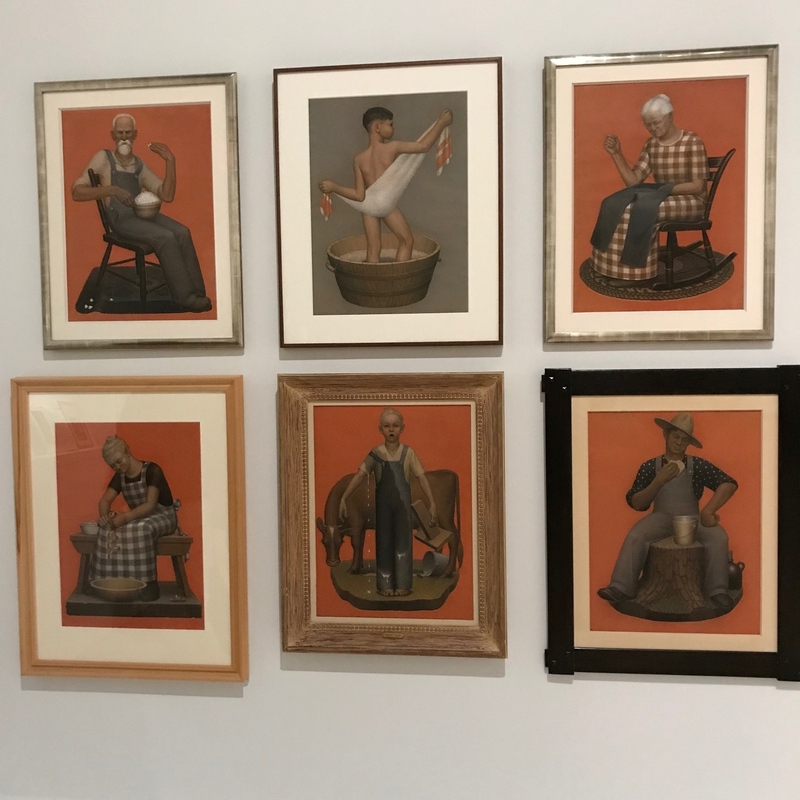 American Gothic and Other Fables exhibit March 2-June 10th, 2018. 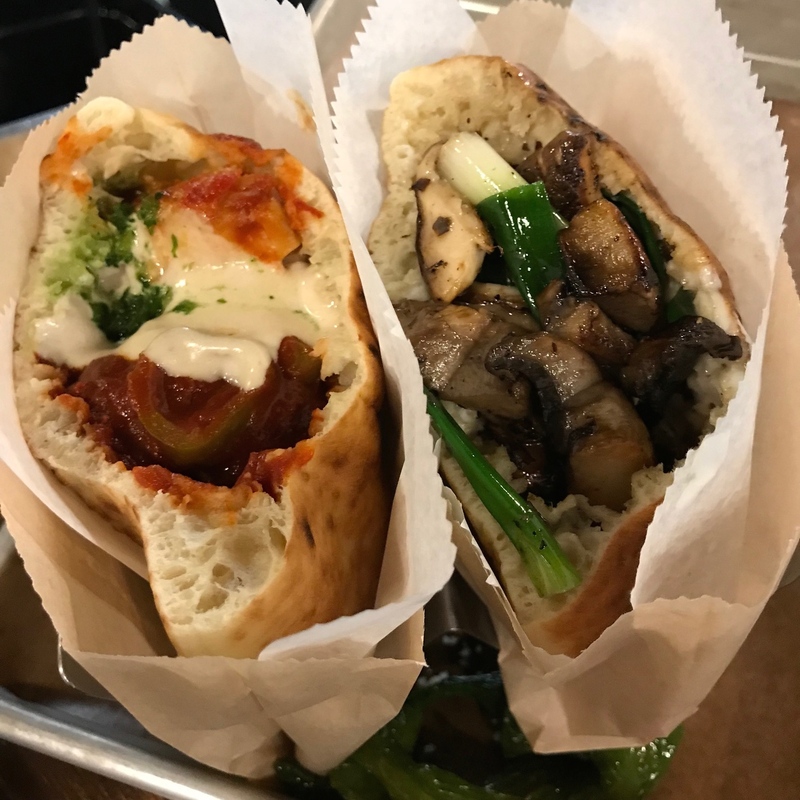 Miznon Chelsea Market 435 West 15th Street New York City. Open Tuesday-Saturday 11am-9pm, Sunday-Monday 11am-5pm.